The new bridge over the forth estuary will connect the North and South of Scotland, with a span of 1.6 miles, the structure is the longest three tower, cable-stayed bridge in the world. Including the new road system which connects the new bridge to the existing road network, the total length of the project comes in at a staggering 13.7 miles. The bridge’s towers stand over 200 metres tall, making it the highest bridge in the UK. 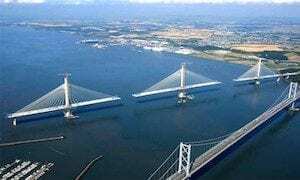 Forth Crossing Bridge Constructors (FCBC) was selected to complete the project– an international consortium consisting of Hochtief from Germany, American Bridge from the USA, Dragados from Spain and Morrison Construction from Scotland, part of the Galliford Try Group.